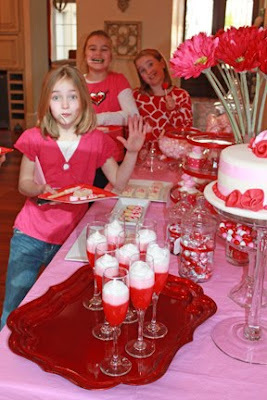 Today I'm sharing a little Valentines party I put together for my own girls a couple of years ago before I really entered the party business. 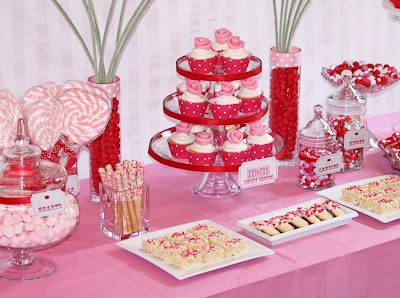 This was a fun idea for a party.... my girls' names both start with the letter "M" so we came up with an "M&M Sweet Shoppe" party. 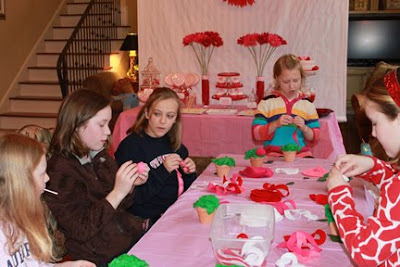 Each daughter invited a few friends over for Valentines crafts and some yummy sweets, too. 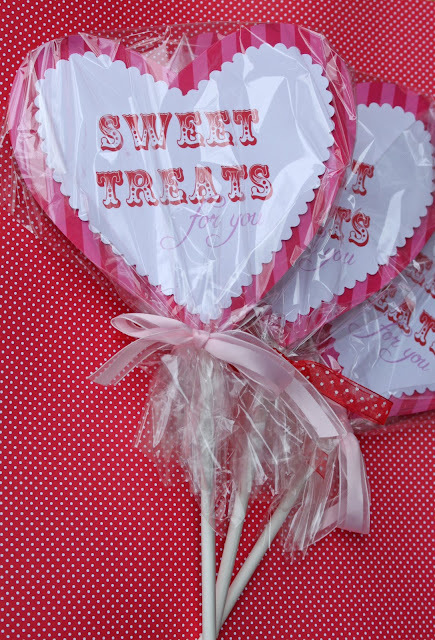 For the invitation, I decided to created a lollipop-look in the shape of a heart and wrapped in cellophane. We took the invitations around to each of the girls houses to get them excited about the upcoming party. The reverse side of the invitation had all the party information. These were my first attempt at fondant roses. I guess I've learned a little since then but they turned out pretty cute. The parfaits were a fun idea, too. 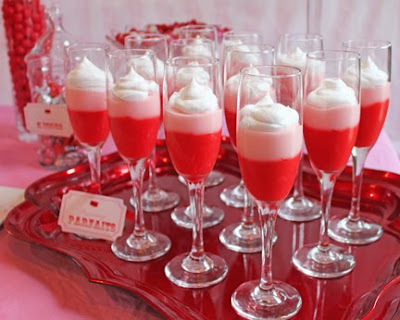 I made some red pudding and some pink pudding and layered them in champagne glasses with a little whipped cream on top. 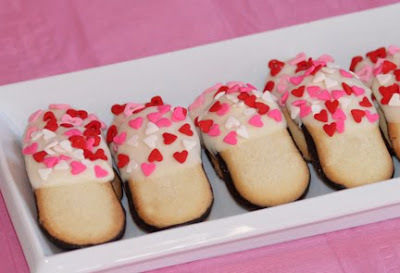 I learned through this experience that putting the pudding into cone-shaped icing decorating bags or a ziploc with the corner cut would be the perfect way to get the pudding in the small glasses without making a mess. 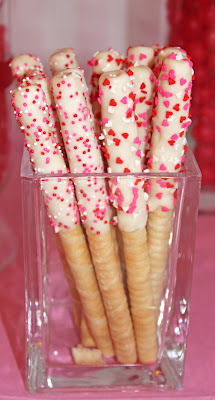 Store bought items like these cookies sticks embellished with a little white chocolate candy coating and Valentines sprinkles make party food so much easier and they're pretty, too. 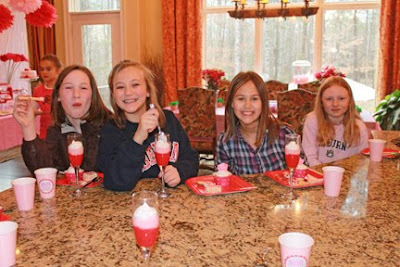 My girls had such a fun time with their girlfriends celebrating the day. 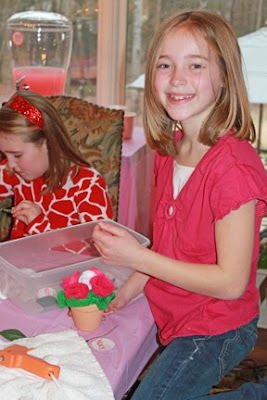 For crafts, I had some felt circles cut into spirals ready for the girls to roll into felt roses. 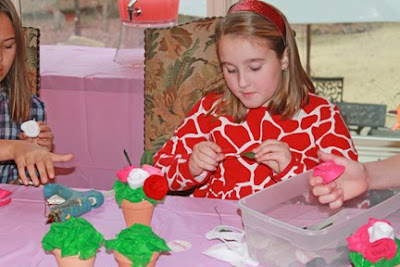 I also had stuffed some mini flower pots with green tissue paper to resemble leaves and the girls then used a low-temp glue gun to glue their roses to their pots. enjoyed a day with their girlfriends even more. I am always so amazed with big party spreads like this! They look sooooo amazing and beautiful!! Feel free to submit this to my link party, would love to share it with more people! Love these ideas. Just linked up to you on my FB page! What a great craft idea!! Love it! 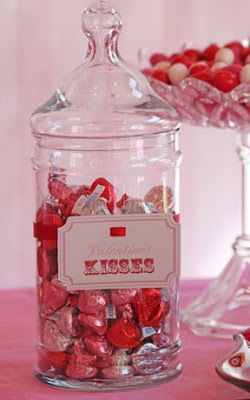 Oh I love it, but where did you get your glass jars, those are so nice and what I would love. Lovely! 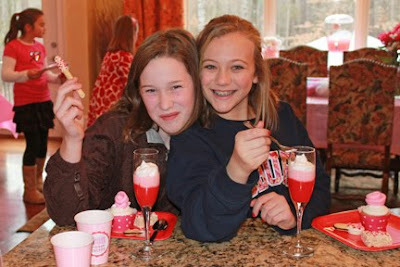 Especially the fondant cake and the parfaits! Beautiful display and great ideas for quick treats! 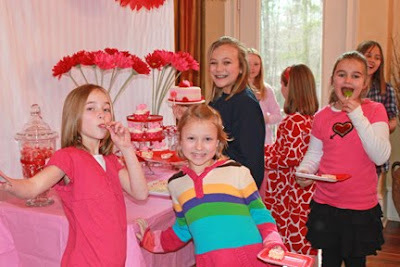 Love this super cute party! absolutely charming! 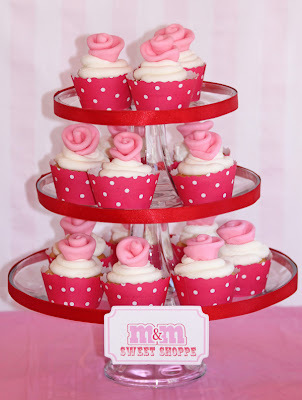 my fav is the polka dot cupcake papers. bravo! This looks so cute! I love the little parfaits! 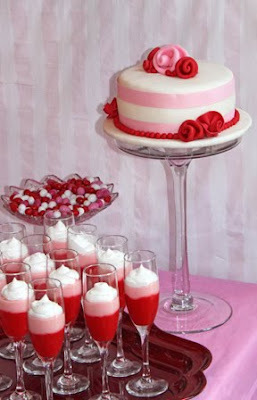 Awww....everything looks so yummy and perfect! 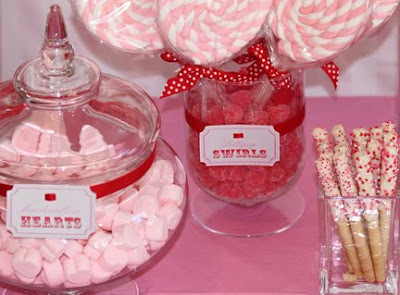 Love all of the little signs with the sweets:) It looks like fun was had by all. So sweet! What an awesome mom you are! Thanks for sharing your fun. You are amazing! They all look like they had such a great time! What a beautiful party!!!!!!! It looks like out of a magazine! So cute! 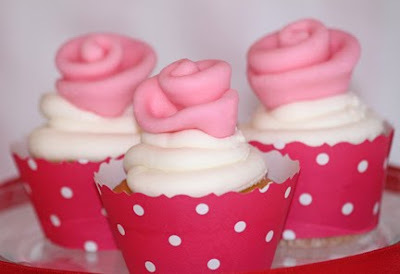 And your fondant roses look great! What a beautiful party and I love the cake too! So many great details! Make the items using bottle caps and use these for these as valentines gifts. THe party looks beautiful. Such great looking decor and food. looks amazing. 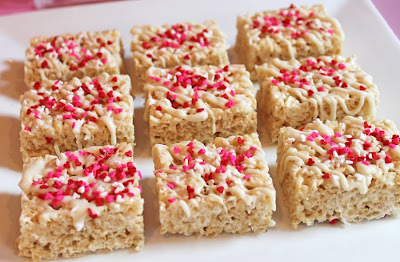 Maybe I'll do this for my kids this V-Day. Yummy I would LOVE for you to stop over and link up in HAPPY FRIDAY- the theme is Valentine. Everyone who links up today will get a Pin from me on Pinterest! Hope you join in the tasty fun! In love with this party. So beautiful! Thanks for sharing your creativity. Gorgeous! I appreciate the hard work you put into this just from the photos ;) Wow, it must have taken major planning! Looks great!! Such a cute party! 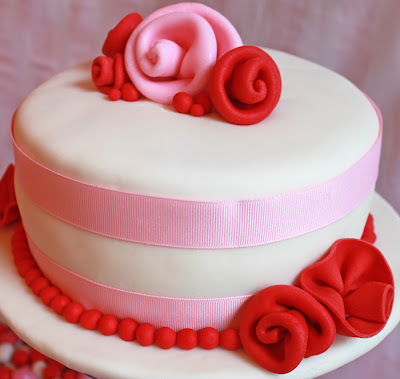 I love all the pink and red and your attention to detail. Just amazing! Inspires me for my son's party, without the pink of course haha. what a fun party!!! I love love all of the red/pink mix... obviously for valentine's day but it wasn't too gushy red/pink over the top.. there was a lot of it but in a classy way. Fun! It looks like your girls and friends had a lot of fun! 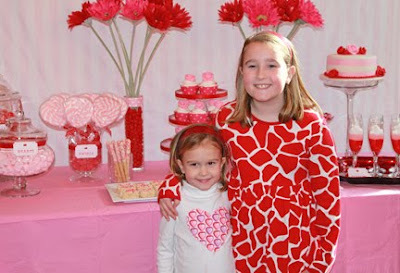 This is the sweetest Valentine's Day party! SO cute! Valentines Printables On Sale Now! Valentines Printables - New Collection!